The financial coordinator's primary responsibility is to manage the campus and community budget and to oversee the spending related to it. The financial coordinator chairs the Allocation Committee that decides how to allocate the money from the budget to different Dwight Hall groups that apply for funding. Aside from the day-to-day activities, she helps groups apply for funding outside Dwight Hall and advises on how to manage their budget and use their money efficiently. Ashali also assists with fundraising. It is the responsibility of the Public Relations Coordinator to communicate the activities, opportunities, and visions of Dwight Hall to the community. Margaret proactively manages the placement of information into media outlets using press releases and direct communication to protect, publicize, and enhance the work and workings of the Hall. As there are many students who are unaware of all the resources that Dwight Hall has to offer, she serves as the contact person to direct people to their specific areas of interest. In addition, Margaret sends out the weekly Dwight Hall email newsletter, the D-Holla. She also helps to plan Dwight Hall events. As the SJN liaison, Frances works with the Magee Fellow, Alisha Jones, and the SJN coordinators, Joshua Williams, Nikolas Bowie, and Betny Townsend, as well as students in SJN member groups. 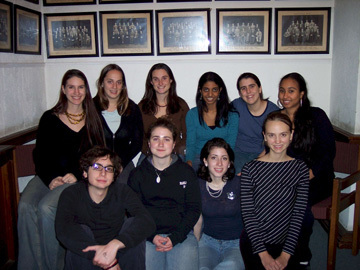 SJN is a coalition of organizations and individuals working for social justice and social change at Yale, in New Haven, and beyond. SJN is dedicated to building a community of social justice advocates, while helping activists develop skills necessary to achieve change. Frances will be working this semester to increase coordination and community in SJN groups. The goals of this position are: 1) to familiarize faculty from across the University with the mission and programs of Dwight Hall; and 2) to encourage a strong working relationship between professors/departments and Dwight Hall groups through which students can avail themselves of faculty resources. Betny seeks to implement these goals by meeting with a broad range of department chairs and professors to discuss both the current nature of Dwight Hall and the interests or experience they might bring to bear on its improvement. She will also work to partner faculty with inclined student organizations, arrange lectures, and generally promote dialogue about the most effective use of University resources. The aim of the Interfaith Coordinator is to engage different communities of faith in the work of Dwight Hall. The Interfaith Coordinator facilitates discussions and events across religious organizations at Yale and in New Haven in order to discover the intersections of various faith traditions at the points of service and justice. The Interfaith Coordinator also seeks to connect different religious groups on campus, organizationally or individually, with Dwight Hall groups. The long term goal of Interfaith Coordinator is to develop a permanent coalition of faith groups that collaborate with each other and all of Dwight Hall to do activism and service.